It takes only one counterexample to disprove the theory of an Old Earth. Most of the "evidence" for an Old Earth is based on claims that lack falsifiability, such as radiometric dating, and hence would not even satisfy minimum requirements for admissibility in a court of law. If each of the following 63 counterexamples to an Old Earth were to have merely a 10% chance of being valid, then the probability that the Earth is billions of years old is less than one half of 1%. In other words, the Earth must be young with a likelihood of 99.6%. The motivation for atheists to insist on falsely teaching that the Earth is old is to pull students away from God's immediate presence and to turn them away from Jesus Christ. Atheists are also motivated, and biased, by the fact that their evolutionist theories require the world to be some implausible billions of years old. Although frequently cited by Old Earth supporters against a young earth, revised and well-supported Egyptian chronology actually provides strong evidence in favor of a young Earth. The oldest direct evidence of life—written documents, clothing, remnants of civilizations, tree rings, etc.—is no older than about 3,000 B.C. and certainly younger than 4,000 B.C., the approximate date of origin of the Earth, based on a straightforward reading of the Bible. While adherents to a belief in an old earth claim of artifacts existing further back than 4,000 B.C., those people come to their conclusions due to their presuppositions (i.e. the lens through which they see the world) that evolution is true, that the Earth is old, and that humans were originally dumb and became more intelligent as time went on. Over 270 cultures have flood legends that distinctly resemble the biblical flood account. While critics like to say the biblical flood account is descended from other stories, in reality, it is the other way around, as the biblical flood account is far superior to any flood legend in multiple ways. Creation legends also exist, but once again, the biblical account is superior. Noah, his sons, and his further descendants mentioned in the Bible are found and named in numerous cultures and there is much extra-biblical evidence for their existence, showing that they were real people who made a real impact. There are royal genealogies in Europe that trace their family lines back to Noah. Ancient cultures all over the world built ziggurat-like structures, such as the Egyptians, Babylonians, and Mesoamericans. This is strong evidence that they originated from one area and that the Tower of Babel was a real, ziggurat-shaped tower. In history, the closer one gets to Babel, geographically speaking, the earlier the civilizations in that area first developed, giving strong evidence that all civilizations were originally from Babel and were dispersed from that location all over the Earth. Even secular historians accept this and call Sumer the "cradle of civilization". The Sumerian King List is remarkably similar to the biblical genealogy in Genesis 5. There is a very close correlation between the two lists (if one excludes Adam and Noah in the Bible), the flood is mentioned, and the kings all have long life-spans, providing strong evidence that the Sumerians recognized the history recorded in the Bible as fact. While many evolutionists point to Egyptian history (which, according to them, dates back long before the biblical creation and flood dates) as proof against a young Earth, a growing number of academics are recognizing that many of the traditional sources for Egyptian history are both inaccurate and misinterpreted, and revised dates for Egyptian history align remarkably well with biblical history. Additionally, radiocarbon dating has given additional evidence that the Egyptian civilization began more recently than originally thought. Because of their worldview, evolutionists believe that ancient man was not as intelligent as today and did not possess superior technology. However, many archaeological findings in numerous ancient civilizations have proven otherwise—that ancient man was very intelligent, possibly even more so than modern day society, as well as more technologically advanced in some ways. Many different cultures throughout history have legends and realistic accounts from historians of dragons. There is very strong evidence that dinosaurs were alive and a very real part of ancient cultures (and even some more recent ones), affirming a young Earth and the biblical account of origins. In fact, there have been some reports of dinosaurs living in the remote jungles of Africa today. There is a striking similarity in the way diverse, worldwide cultures see constellations. In very diverse cultures, the constellations that the people see are the same, and the meanings of many are the same, including the Big and Little Dippers, showing that people had to have developed them together, rather than on opposite directions of the globe. Academics (including secular ones) have been able to trace back, through the precession of the Earth, when the constellations were developed by man, and the dates found have been, roughly speaking, between 2800 BC and 2100 BC, right in line with the date of the dispersion at Babel. Additionally, it has also been found that the latitude of where the developers of the constellations lived was, roughly speaking, between 30 and 42 degrees latitude, again in line with the locations of Ararat and Babel. It has been well-documented that people in the past vastly exceeded modern humans physically and mentally. 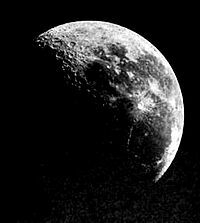 The Moon's orbit is a very strong counterexample: the moon is receding from the Earth at a rate that means it cannot be more than 1.37 billion years old, much less than the often claimed 4.5 billion years. In fact, this assumes the moon would star off touching the earth and so within the Roche limit, which would not be possible without causing instability in its orbit, tidal catastrophes on Earth, and other problems that would have prevented the Earth and the Moon being as they are today. Additionally, the moon's orbit is becoming increasingly and unexpectedly eccentric, suggesting a lack of long-term stability, which further disproves the theory of an Old Earth. Spiral galaxies appear to be young, and only implausible proposals of the existence of dark matter can reconcile the spirals with a belief in an old universe. The expansion of the universe is accelerating, something that would not occur if the Big Bang had happened billions of years ago; the acceleration suggests that the Big Bang (or creation) was recent. The planetary orbits in the Solar System - including Earth's - are unstable and unsustainable over the long periods claimed by Old Earth believers. At least one spiral galaxy spins in the direction opposite to the spin of its tail, suggesting an age that is too young to have generated the tail, and contradicting the theory that the tails of spiral galaxies were formed over a long period of time. The oldest star in the universe is only 6000 light years away from Earth, precisely as predicted by the Bible and a Young Earth model. The surface of Pluto was found during the New Horizons mission to have far fewer craters than expected, and it was found to have a nitrogen atmosphere that is leaking away at too fast a rate for it to be millions or billions of years old. Both of these evidences provide strong evidence for a young universe. Blue-eyed people are known to be only 6,000 to 10,000 years old. Moreover, the number of blue-eyed people is steadily diminishing, further suggesting that humans have not been in existence long. "DNA in “ancient” fossils. DNA extracted from bacteria that are supposed to be 425 million years old calls into question the age calculation, because DNA could not last more than thousands of years." The intelligence of humans is rapidly declining, whether measured by SAT scores, music, personal letters, quality of political debates, the quality of news articles, and many other measures. This means that if one goes back far enough, intelligence would measure at ridiculous heights, if humans were even tens of thousands of years old. The age of onset of sexual maturity is rapidly changing, suggesting that life is in a short-term rather than long-term equilibrium. "Living fossils — jellyfish, graptolites, coelacanth, stromatolites, Wollemi pine, and hundreds more. That many hundreds of species could remain so unchanged, for even up to billions of years in the case of stromatolites, speaks against the possibility that these species are millions and billions of years old." The high observed rate of extinctions of species and harmful genetic mutations suggest a relatively short period for the existence of life rather than a long one. "Living fossils — jellyfish, graptolites, coelacanth, stromatolites, Wollemi pine and hundreds more. That many hundreds of species could remain so unchanged, for even up to billions of years in the case of stromatolites, speaks against the millions and billions of years being real." The age of onset balding or of graying of hair is rapidly decreasing, with many teenagers now experiencing baldness or premature graying (CNN's Anderson Cooper began graying as a teenager and was fully gray long before age 40); many celebrities (such as American Idol winner Taylor Hicks graying in his 20s) and athletes (such as Cal Ripken, Jr. graying and balding in his mid-30s) increasingly experience premature graying or balding. The age of onset of cancer is markedly decreasing, suggesting rapid changes inconsistent with an alleged long existence to life. "Someone born in 1990 would have twice the risk of colon cancer and four times the risk of rectal cancer than at the same age had they been born in 1950, according to researchers at the American Cancer Society and the National Cancer Institute." The number of natural, pure-bred bred dogs declines over time as dogs naturally crossbreed; a short period of time is suggested by the fact that there are over 100 different natural, pure breeds of dog thriving today. Lack of genetic diversity among the Homo sapiens species. Were evolution and the old earth theory true, the human population would show much larger genetic variance. Some scientists have calculated that a troop of 55 chimpanzees contains more genetic diversity than the entire human race; this demonstrates that chimpanzees descended from a large initial population while humans have descended from a much smaller one, which indeed we know to have been two people. Frequent occurrences of numerous deaths of birds and fish, which if extrapolated over millions of years would result in little or no such life today. The separation between salt and freshwater fish, coupled with their inability to survive in the opposing environment, shows a lack of millions of years of evolution to enable them to spread to the opposing environment. Furthermore, the separation of land and aquatic life and a similar inability for the organisms to survive in the other environment shows a lack of millions of years of evolution to enable them to spread to the opposing environment. Biodiversity on Earth is declining too rapidly to be consistent with a long-term (Old Earth) equilibrium, with the Living Planet Index (LPI) showing "a global decline of 27% between 1970 and 2005. The terrestrial index declined by 25%, freshwater by 29% (this index is calculated to 2003 due to the lack of data available for latter years), and marine by 28%." The Bible makes references to the dinosaurs. There is no explanation for this if dinosaurs supposedly lived hundreds of millions of years ago. The sulfurization of organic matter, once thought to take tens of thousands of years, has been found to only take hours to complete. An analysis of mitochondrial DNA shows that humans and most animal kinds came from common ancestors that lived later than 4000 BC, indicating a recent creation and the existence of a genetic "bottleneck" resulting from the Great Flood. Based on erosion rates, Niagara Falls is known to be less than 15,000 years old, even as admitted by atheistic scientists who believe in an Old Earth. The interior of the earth is as hot as the sun—far hotter than atheists thought—and such heat would have dissipated and the radioactivity decayed if the earth were old. The magnetism of the Earth is vanishing so quickly that it will disappear in 1,500 to 2,000 years; extrapolating backwards does not permit an Old Earth. Paraconformities — where one rock stratum sits on top of another rock stratum but with supposedly millions of years of geological time missing, yet the contact plane lacks any significant erosion; that is, it is a “flat gap.” E.g. Coconino sandstone / Hermit shale in the Grand Canyon (supposedly a 10 million year gap in time). See: Age of the earth. The frequency of large earthquakes (more than 6.99 on the Richter scale) doubles roughly every 40 years, rendering long-term stability impossible. Large earthquakes have increased by more than 20% in only the last decade. "Researchers are left scratching their heads, trying to understand possible reasons for the uptick in seismic activity in Oklahoma." The continued existence of fragile natural arches without having collapsed despite a short time period for erosion and stresses on them. An extrapolation of time between the collapse of weaker arches with still-standing stronger arches supports a young earth age. The massive Great Lakes and freshwater lakes near the equator could not have existed for millions of years, and several of these lakes are rapidly receding in volume; the third largest saltwater lake, Oroumieh Lake, could completely evaporate within the next five years. The existence of inland saltwater lakes at high altitudes, such as Mono Lake and the Great Salt Lake, suggest a recent global flood. The relative purity of underground well water, which would be a muddy slurry had millions of years of erosion taken place. The plentiful supply of high concentrations of underground well water, which would be expected based on familiar principles of entropy to dissipate over a long period of time. The lack of erosion between rock layers. Levels of contamination in water are rising, as water proceeds through the water cycle it becomes progressively more contaminated. If earth (and life) had existed for billions of years, a limit would have been reached long ago where water (essential to life) became too contaminated for life to continue. All carbon dating of water supplies, even the most ancient and the deepest underground reservoirs, result in relatively young ages, and no water has been found suggesting an Old Earth. The ratio of strontium isotopes in seawater, which should change due to long-term erosion, has varied by only 0.35% throughout history. In fact, its value today is exactly the same as in the oldest samples, which are claimed to be from 500 million years ago. The relatively recent separation of the still-moving continents from one land mass—denied for 100 years by atheists before they accepted it—suggest a young earth or at least a relatively recent cataclysmic event. Fresh tracks of motion by stationary rocks are still visible in some areas, baffling Old Earth scientists for more than 60 years; Old Earth magazines refer to them as "self-moving rocks." Beaches have long been eroding far too quickly for the Old Earth theory; "between 80 and 90 percent of the sandy beaches along America’s coastlines have been eroding for decades," sometimes by as much as 50 feet per year. Land is sinking into the oceans at a rate of at least 7 inches per century, which would have rendered most of the United States under water if the Earth were not young. The flow of water in the Colorado River has been declining since the early 20th century, even after usage is considered, and the man-made Lake Mead is at risk of drying up in the next decade. Erosion of rock is far faster than atheist geology previously thought . Secular science now admits that mountains don't last long, but remain strangely silent on the obvious implication. Also in the same article: extra soil created by erosion scrubs greenhouse gas CO2 from atmosphere. Contrary to evolutionary assumptions that diamonds formed in conditions where there was no water, researchers collected diamond samples from deep within the Earth's crust and found in 2018 ice embedded in the diamonds. This is consistent with the biblical accounts of the creation and the global flood, including 2 Peter 3:5–6. William R. Corliss also provides scores of anomalies, which challenge the Old Earth paradigm. An accomplished author, Corliss has written 13 books for the National Aeronautics and Space Administration (NASA), a dozen educational booklets for the Atomic Energy Commission (AEC), and a dozen articles for the National Science Foundation (NSF). The science magazine New Scientist had an article which focused on the career of William Corliss. New Scientist wrote regarding Corliss's work: "All I can say to Corliss is carry on cataloging." Arthur C. Clarke described Corliss as "Fort's latter-day - and much more scientific - successor." Recent discoveries of surviving soft dinosaur tissue upset the Darwinist claim that they became extinct 65 million years ago. View Armitage's presentation of his results at the Southern California Academy of Sciences meetings in 2013 and 2014. A number of other peer-reviewed papers found similar results. Fossils have been found, such as footprints, showing that dinosaurs and mammals lived together at the same time. A stalemate of significant and valid discoveries in the last several decades. The Bible contains multiples pieces of evidence showing its authenticity including Bible history, Bible archaeology and Bible prophecy. Competent and honest Bible exegesis indicates the earth is approximately 6,000 years old. See also: How reliable is biblical chronology? Landis, Don (2015). Secrets of Ancient Man. Green Forest, Arkansas: Master Books. ISBN: 9780890518663. Hodge, Bodie (2013). Tower of Babel: The Cultural History of Our Ancestors. Green Forest, Arkansas: Master Books. ISBN: 9780890517154. Landis, Don (2012). The Genius of Ancient Man. Green Forest, Arkansas: Master Books. ISBN: 9780890516775. Brown, Walt (2008). In the Beginning: Compelling Evidence for Creation and the Flood (8th Edition). Center for Scientific Creation; 8th edition (December 1, 2008). ISBN: 978-1878026095. ↑ The same analysis could be applied to the Young Earth theory, but no valid counterexamples have been found in centuries of atheist attempts. In addition, there are over 100 proofs of a young earth and universe (See Age of the earth: 101 evidences for a young age of the earth and the universe). ↑ Mortenson, Terry (July 7, 2015). Trillions of “Artifacts”—Who’s Really Got the Problem?. Answers in Genesis. Retrieved April 13, 2017. ↑ Climer, Phillip (May 23, 2012). Archaeology and the Bible. Answers in Genesis. Retrieved April 13, 2017. ↑ Legends of the Flood. Answers in Genesis. January 30, 2014. Retrieved August 18, 2016. ↑ White, Monty (March 29, 2007). Flood Legends. Answers in Genesis. Retrieved August 18, 2016. ↑ Lacey, Troy & Anderson jr, Lee (October 1, 2013). The Genesis Flood—Not Just Another Legend. Answers in Genesis. Retrieved August 18, 2016. ↑ 8.0 8.1 Ham, Steve (March 29, 2011). Is Genesis 1–11 a Derivation from Ancient Myths?. Answers in Genesis. Retrieved August 18, 2016. ↑ 9.0 9.1 9.2 9.3 Hodge, Bodie (August 19, 2010). Chapter 28 - Was the Dispersion at Babel a Real Event?. Answers in Genesis. Retrieved August 18, 2016. ↑ 10.0 10.1 Landis, Don (2015). Secrets of Ancient Man. Green Forest, Arkansas: Master Books. ISBN: 9780890518663. ↑ Mark, Joshua J. (April 28, 2011). Sumer. Ancient History Encyclopedia. Retrieved September 5, 2016. ↑ Mark, Joshua J. (September 2, 2009). Mesopotamia. "'Ancient History Encyclopedia. Retrieved September 5, 2016. ↑ McClellan, Matt (August 24, 2011). Ancient Egyptian Chronology and the Book of Genesis. Answers Research Journal. Retrieved August 18, 2016. ↑ Mitchell, Elizabeth (July 22, 2010). Chapter 24 - Doesn’t Egyptian Chronology Prove That the Bible Is Unreliable?. Answers in Genesis. Retrieved August 18, 2016. ↑ Mitchell, Elizabeth (April 1, 2008). Dating the Pyramids. Answers in Genesis. Retrieved August 18, 2016. ↑ Mitchell, Elizabeth (September 19, 2013). Radiocarbon Dating Shortens the Timeline for Ancient Egypt. Answers in Genesis. Retrieved August 18, 2016. ↑ Landis, Don (2012). The Genius of Ancient Man. Green Forest, Arkansas: Master Books. ISBN: 9780890516775. ↑ Ham, Ken (December 31, 2012). Geniuses, Not Brutes!. Answers in Genesis. Retrieved August 18, 2016. ↑ Hodge, Bodie (October 1, 2011). Dragon Legends—Truths Behind the Tales. Answers in Genesis. Retrieved August 18, 2016. ↑ Dragons: Fact or Fable?. Answers in Genesis. Retrieved August 18, 2016. ↑ Ham, Ken (October 25, 2007). Chapter 12 - What Really Happened to the Dinosaurs?. Answers in Genesis. Retrieved August 18, 2016. ↑ 23.0 23.1 23.2 Nelson, Brooke C. (October 5, 2016). Do the Big and Little Dipper Support the Bible’s Timeline?. Answers in Genesis. Retrieved October 16, 2016. ↑ 24.0 24.1 24.2 Henry, Jonathan F. (December 2008). Constellations: legacy of the dispersion from Babel. Creation.com (taken from Journal of Creation 22(3):93–100). Retrieved October 16, 2016. ↑ Pierce, Larry (April 5, 2017). What Were Early Post-Flood People Like?. Answers in Genesis. Retrieved April 5, 2017. ↑ "Measurements show that the Moon is receding from Earth at a rate of about 3.8 centimeters per year." Measuring the Moon's Distance Apollo Laser Ranging Experiments Yield Results by Fred Espenak, GSFC Planetary Systems Laboratory (LPI Bulletin, No. 72, August, 1994). ↑ Some insist there is hokey, unseen "dark energy" and "dark matter" to try to explain the acceleration. ↑ Existence of collisional trajectories of Mercury, Mars, and Venus with the Earth by J. Laskar & M. Gastineau, Nature 459, 817-819 (11 June 2009). Believers in an Old Earth speculate that the instability would not result in problems in a billion years, but other computer simulations could be developed to demonstrate multi-body instability for the solar system far more recent than that. ↑ "Hubble Shows Galaxy Rotating In The Wrong Direction"
↑ Pluto’s Young Surface. Answers in Genesis (from Answers Magazine). October 1, 2015. Retrieved November 4, 2016. ↑ E.g., Civil War letters. ↑ E.g., contrast the Lincoln-Douglas debates with debates today. ↑ The Federalist was written for the newspaper audience in the late 1780s, but is far too intellectual for newspapers today. ↑ "There's a man, close-cropped gray hair, looks older than 35": Sports Illustrated's description of Cal Ripken at 35. By age 50 he was bald too. ↑ Faster than we thought: Sulfurization of organic material: New research is changing our understanding of the carbon cycle. ScienceDaily (from Washington University in St. Louis). August 30, 2018. Retrieved September 16, 2018. ↑ Jeanson, Nathaniel T. (July 27, 2018). Hundreds of Thousands of Species in a Few Thousand Years? Answers in Genesis. Retrieved December 28, 2018. Guillen, Michael (November 24, 2018). Did a mysterious extinction event precede Adam and Eve? Fox News. Retrieved December 28, 2018. ↑ The theory of an Ice Age to carve Niagara Falls less than 15,000 years ago is inconsistent with its shape and with much other geological evidence. ↑ A similar analysis may be performed for the likelihood of devastating collisions with meteors as time is extrapolated by orders of magnitude. ↑ Gramling, Carolyn (March 8, 2018). Diamonds reveal sign of the deepest water known inside Earth. ScienceNews. Retrieved March 19, 2018. ↑ Armitage, M.H. and K.L. Anderson. 2013. Soft sheets of fibrillar bone from a fossil of the supraobital horn of the dinosaur Triceratops horridus. Acta Histochemica 115:603-608. ↑ Armitage, M.H. and K.L. Anderson. 2014. Light and electron microscope study of soft bone osteocytes from a Triceratops horridus supraorbitalhorn. Microscopy & Microanalysis (Hartford, CT). ↑ Mark H Armitage - Report Of Soft Tissues In A Triceratops Horn (conglomeration of talks presented at the Southern California Academy of Sciences meetings in 2013 and 2014). ↑ Borg, Julie (February 9, 2018). Dinosaur party or evidence of the flood? Baptist Press. Retrieved February 22, 2018. ↑ Though there has been some progress in this timeframe, many of the "discoveries" are liberal propaganda, or are scientifically weak. ↑ Should Genesis be taken literally? This page has been accessed 314,514 times.